Check out this video showing how a dentist places a white filling. White fillings as also known as “plastic fillings” “composite resin” and “resin fillings”. They are common and can be very strong! Check out how steps are involved in making a white filling. We place more layers to help customise the shape and strength of the filling. 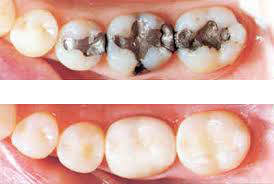 It generally takes longer to place a composite filling than it does for a metal filling. This is because white fillings require the tooth be kept clean and absolutely dry while the cavity is being filled – otherwise they don’t last! No filling lasts forever, and white fillings are just one way that a dentist can fill a tooth.